RYPEN, The Rotary Youth Program of Enrichment, is for young people aged 14 to 16 years and caters for teenagers who have shown qualities of decency, courage, persistence, sincerity and application in everyday life, which deserve further development. RYPEN uses the common bonds of learning, co-operation and friendship to design activities which facilitate trust and self esteem. It seeks to broaden each participant’s horizons culturally, socially and academically, providing the inner foundations for a strong future. RYPEN is an residential conference held over one weekend arriving on the Friday afternoon and finishing Sunday afternoon. See dates for upcoming conference below. With the merging of Rotary Districts and the numbers of applicants involved, the RYPEN program is now conducted twice yearly by the District 9750 RYPEN Committee . The first of these is usually conducted over the second weekend in the September and of recent times at Sydney Olympic Park Lodge , 1 Jamieson St, Newington Armory, Sydney Olympic Park. To apply to attend, please complete the Rotary Application Form found on the Rotary District 9675 website [ click here }. Once completed students intending to be sponsored by Engadine Rotary must have their application papers endorsed by Engadine Rotary Club. Do this by contacting our Youth Services Director, Peter Sheehy on 9520 0822 or email petersheehy10@gmail.com to indicate your interest. Please note 1.That all Rotarian Volunteers associated with Youth programs are subject to clearance under the NSW Working with Children Check 2. RYPEN student(s) sponsored by us are usually subsidised by Engadine Rotary . Engadine Rotary nominated and subsidized Emily Lumsden,from Engadine High School to attended the September 2016 Rypen program at the Olympic Lodge Homebush. This was followed by her attendance our recent annual Christmas meeting on 19th December when she gave a short presentation to Club members. 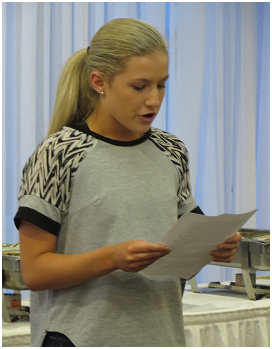 Emily spoke about how she really enjoyed RYPEN and gained a great deal from it and ideas for her future studies. Our latest advice is that Emily has since been elected Vice Captain of Engadine High for 2017. Engadine Rotary congratulates Emily on her achievements and wishes her well in her future endeavours.